Easily get settled into your new home with these moving tips focused on helping the unpacking process go quickly! Bryan and I just completed our 5th move in 4 years. We are officially no longer living in the city of Chicago and are back in the suburbs, a fact that Bryan might be struggling with a little bit. Ok – maybe me, too, a little bit. I will miss getting to walk through the zoo or to the beach whenever I want and I will miss driving home from family to see the cityscape inching closer and closer. But it was time. With our little one on the way, being out in the burbs just felt like the right move. It felt easier for sure, especially when we found a place that allows me to bring in groceries right through my patio door if I want instead of parking in a garage, walking through the alley and around the corner to our building, up 3 flights of stairs and 7 doors. Good changes have definitely come from this move! I will hop on sometime soon with a glimpse of our new apartment, especially as I start decorating the nursery, but, in the meantime, I thought I would drop by with some moving tips we have picked up along the way. 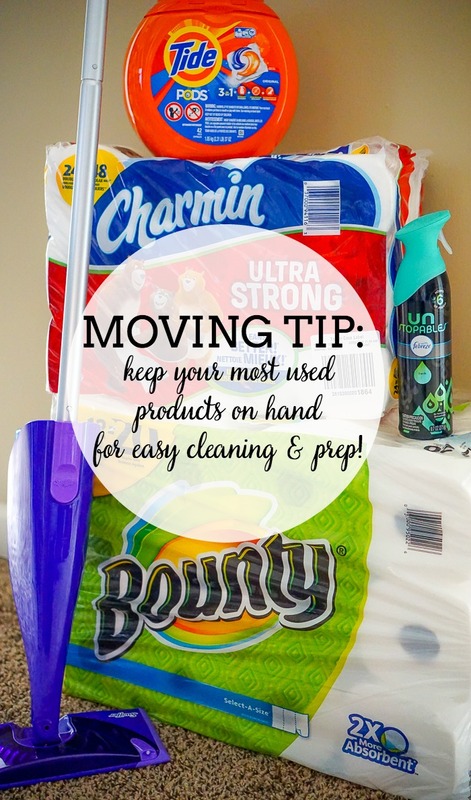 More specifically Moving Tips to Help Unpacking Go Quickly! As a general rule of thumb, Bryan and I have always been unpacked and settled in under a week. We both hate seeing boxes sit around forever, so our goal has always been to unpack quickly. This time around is taking us a bit longer to achieve the No Box status, but I’m blaming the pregnancy and the 90 degree heat. I’m not moving as quickly as I did the last 4 moves, and we also took a break when some family came to visit. Even with slowed down preggo over here though, we had almost everything unpacked and in its proper spot in 6 days. The stress of moving is greatly reduced when you can make this happen. So let’s chat about how I actually make this possible and what products make it so much easier! We thankfully had a lot of notice before moving, which meant we had a couple months to start the purging process. However, even if you only have two days (which is something we’ve tackled before), taking the time to purge will make packing and unpacking easier. Create piles for trash and donating, plus keep good records of what you donated for tax season before you drop them off. Bonus if you live in an area where they will come pick up your donations from your house. You both need to take the process seriously though for it to be successful. We definitely had a few debates as Bryan tends to be more of a hoarder than I am. For the most part, you are going to want things that are together in your current home together in your new home, so pack them together. For example, when you empty a drawer in the kitchen, have those items all go into the same box or container so that they are still together when you unpack them. Or if you have a basket you like using in the bathroom, make sure you pack it with the bathroom stuff or – even better – with its current contents still in the basket instead of making a whole box full of baskets. Packing by location for most things instead of categories will make the unpacking process go by much faster! There are lots of different labeling systems out there – symbols, color coding, etc. I prefer putting the simple Sharpie marker to the box. Here is why. If you have any help at all, it is unreasonable to expect your helpers to learn and understand any system of coding. Therefore, just write KITCHEN, MASTER BEDROOM, DOWNSTAIRS BATHROOM, etc. If you are clear, it is more likely the boxes will get into the rooms where you want them, which is integral to fast unpacking. Also, I like to also write what is IN the box. Many people will call this overkill but it’s another one of those things where the pre-work makes unpacking so much faster. I don’t want to open endless boxes looking for my plates if that is what I am ready to unpack. I want to find the box that I took an extra 20 seconds to write “plates” on. Plus, it has saved me lots of time and annoyances because Bryan can read to find something instead of asking me to play genie and accurately guess where I put the tv cords. When you are disassembling furniture, keep baggies and packing tape near by so you can tape any hardware to the furniture. It is so much easier to put furniture back together when everything you need is right where instead of going to search for it. This is, of course, not a perfect science unless you have had the time to measure every wall in your new place. However, you can get a pretty good idea of furniture placement before arriving. This echoes the sentiment of LABEL LABEL LABEL. If you know where things need to go, it takes less time moving it again later. I loved being able to stand there and tell our movers where almost every piece of furniture was going because I certainly was not going to be much help to Bryan later with moving furniture. I like to label a few boxes as FIRST NIGHT BOXES, meaning things we want opened and/or settled right away. Toiletries: Hand towels and bath towels, shower curtain and hooks, Charmin® Ultra Strong Toilet Paper, shampoo/conditioner, body wash, face wash, toothbrush, toothpaste, and soap. 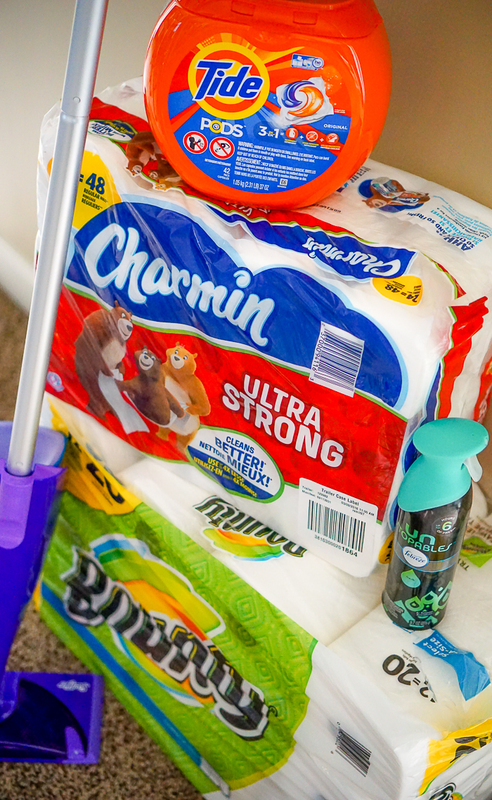 I like to start in the bathrooms first by quickly washing the floors with my Swiffer® WetJet Mop (man, do I love how easy it is to get a clean floor when my WetJet Mop is around) and by adding Charmin® Ultra Strong Toilet Paper, soap and a towel. People will need to go to the bathroom so having this set up immediately makes me feel better. I also spend a little extra time in one of the bathrooms to hang up a shower curtain if need be and unpack the first aid kit, the shampoo/body wash, and the towels. This means that when people are ready to take a shower at the end of the night, they can do so without digging through even more boxes. Then, I like to get bedrooms prepped that need to be slept in that night. This is similar to the bathroom – when you are done for the night, you don’t want to have to dig through boxes for everything you need. You just want to crash. We get the furniture in place, the bed built (thank you to our movers for doing this for us! ), our electrical cord needs taken care of for cell phone charges, standing fans, etc. 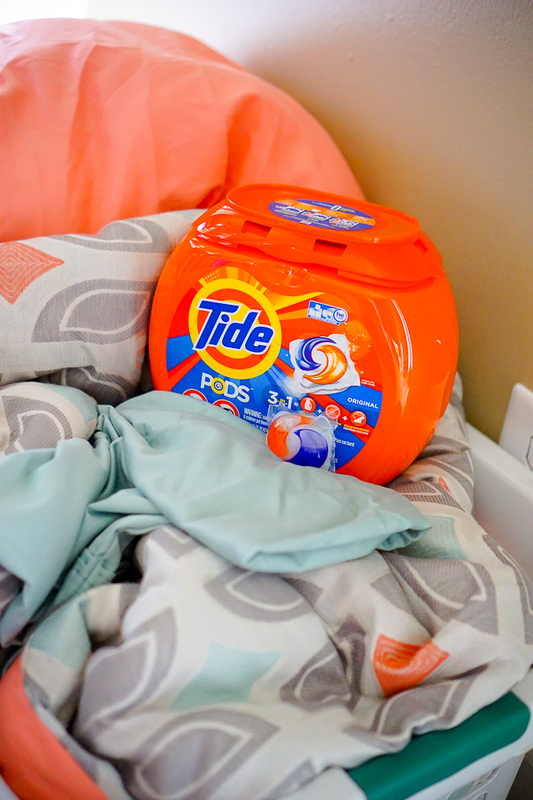 Then, I use our Tide® PODS® Laundry Detergent I kept handy to wash bedding. This is a personal preference for us but we love having freshly washed bedding on the first night in our new home (and packed bedding will just never feel truly clean). 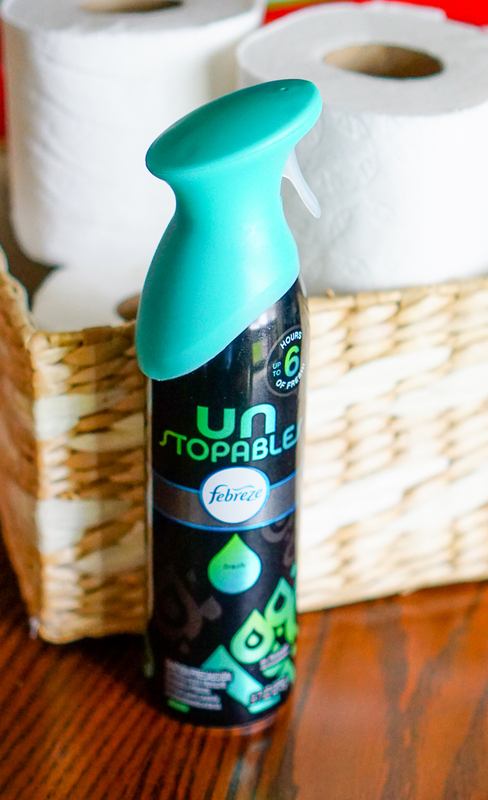 Before I leave, I like to leave a spritz of Unstopables™ Air Refresher in the room … plus maybe walk with it to the front of the apartment again so the whole apartment smells amazing! While the sheets are being washed and dried, I then start in the kitchen. How much I accomplish this first day will entirely depend on what time I arrived that day. Having the KITCHEN FIRST NIGHT box makes it much easier to feel like you have access to kitchen necessities and less pressure to dig into unpacking everything else. If you have time though, this will be the room you probably need the most, so get cracking. I recommend using your WetJet again so your kitchen floor is nice and clean before starting, especially if you are unpacking dishes on the floor at all. If you packed everything together how you like it, it should speed the process up. Unless you have a whole new kitchen set up like I do, and then it might take a quiet house to think straight and unpack everything. Just remember – everything will work out! No move ever goes 100% smoothly without any hiccups, so try to take a breath and enjoy the whole process. Don’t forget to celebrate! I agree – purging before moving is best. Less to pack, which means less to move, which equals less to unpack. Great tips, thanks for sharing! I love the weekender bag idea, I wish we had done that all the times we had moved!